Indoor positioning based on ultra-wideband radio signals remains a challenging problem, in particular due to error induced by non-line-of-sight propagation conditions. The MINT (multipath-aided indoor navigation and tracking) approach exploits the geometry of deterministic multipath components (MPCs) in such situations. 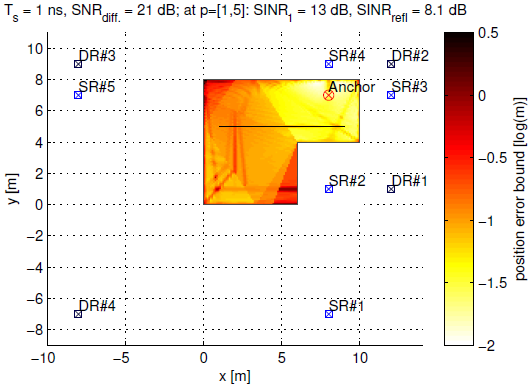 Reflected multipath components are accounted for by virtual signal sources, indicated as "SR" and "DR" in the figure. The figure shows the Cramèr-Rao lower bound of the position error for this scenario. The bound has been derived from a channel model, where diffuse multipath is represented as a colored Gaussian process that influences the effective SNR of deterministic MPCs. The adverse effect of path overlap is seen. Computational results and analysis show a three-fold importance of a large signal bandwidth: The bandwidth reciprocal (i.e. the pulse duration) multiplies the error standard deviation - a fundamental result well-known from AWGN channels. But it also multiplies the effective power of the interfering diffuse multipath and gives rise to additional path overlap. A minimum bandwidth of 1 GHz seems appropriate and sufficient. For further information, please contact Klaus Witrisal or Paul Meissner.